Camping out in Alabama Hills, LeeAnne and I were planning on heading back to the Whitney region in the next day or two but had no idea what we wanted to do. I was going through guides and the mountain project app on my phone looking for inspiration, and eventually came across a comment by Ben on the Star Trekkin' page. From there I re-read his TR on star trekkin' and with new motivation, by the morning it was decided we'd give the Star Trekkin' - Mithral link-up car to car a shot. It had been a while since my last C2C day, I was overdue for another anyway. Despite the sub-optimal weather forecast for the Whitney region (40 mph gusty winds! P=G? 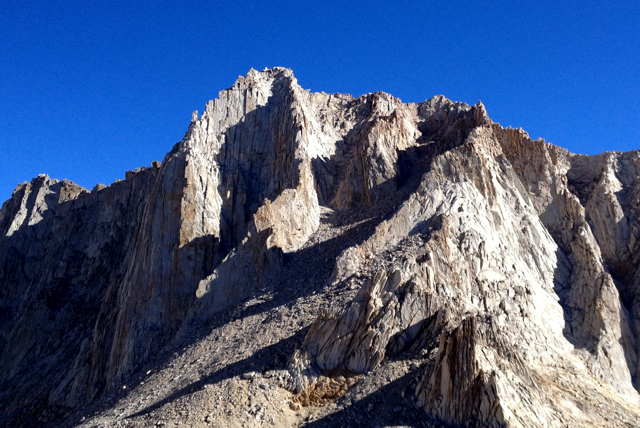 ), after a few hours at the ranger station in Lone Pine we had grabbed a permit for north fork for the following day. We hit the trail at 3am and were making good time, until we got to the part of the approach with the slabs and manzanita up to upper boy scout. We'd been warned by a few people in the portal that due to storms, that that part of the approach was more elusive than usual. You'd think that after doing the approach maybe 10 times now, that it wouldn't be a problem for me... but the trail went ahead and got itself lost anyway, and we met some manzanita. I blame only ever being on the trail in the dark and sleep deprived... One particularly mean manzanita tripped me up something awful and I wound up pulling something in my quad, leaving me partly broken for the rest of the trip. Even with the trail finding setback and my little injury forcing me to slow my pace a little, we were at the base of Russell by 9:00. If the manzanita were the first crux of the day, the winds we encountered as we came over the Whitney Russell pass were surely the biggest crux of the day. It was sunny and clear out, and if it hadn't been for those meddling winds it would have been a perfect day. Unfortunately, the gusts made it frickin' cold, so much so that even with a light puffy and wind shell we were both shivering. Interestingly though, the winds might have helped us in the end. The one thing I was uncertain about with the logistics of the link-up, was how we'd rap Mithral if there were the usual traffic on the climb. But, with the gusting winds, we were the only ones on Russell all day long. Go figure. We decided to wait until the winds died down or until the routes went into the sun to start. We ducked down behind a boulder and played the waiting game for an hour and a half (!!!) until the top part of the Star Trekkin' face went into the sun. The winds were still horrible, though in a classic case of denial we kept commenting on how we thought they were "getting better". And with that, we finally started climbing at 11:00. With a bit of scrambling and simul climbing, I ran up the first two pitches of Mithral in one long pitch, stopping at the ledge just right of the start of Star Trekkin'. LeeAnne led the crux of the route, and to my dismay (because I had hoped to lead it) linked it with the phenomenal hand crack above. In the end, this was for the best as whatever I pulled in my leg began to get excruciatingly painful whenever I weighted it. The crux moves on Star Trekkin' were STELLAR, I couldn't believe how fun they were. The thin crack in the corner, through the bulges, with the features to use on the face - I couldn't have designed it better myself. The wind added a bit of excitement to the day - we could hear the gusts coming maybe 5 seconds before they got to us, so then it was just a matter of bracing yourself and doing everything you could to keep from blowing off the wall. 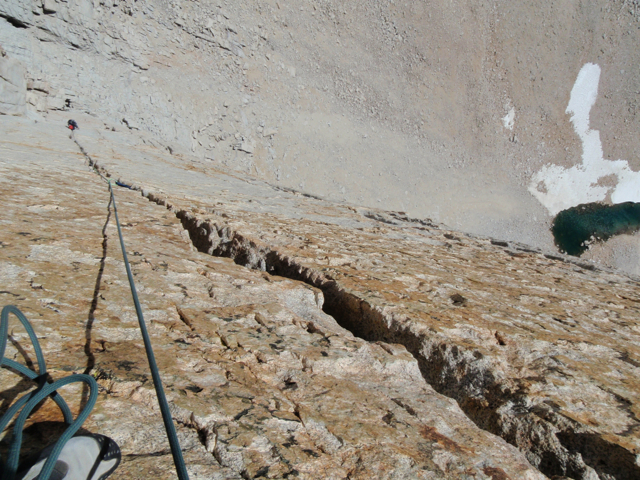 Having done the two money pitches of Star Trekkin', around 2:00 we made the good/bad decision to go ahead with the link-up and get back over to Mithral and rap down to where we'd left off on it (the base of the dihedral). We had a brief moment of distress as the wind tried to get our rope stuck, but after a few long minutes, which felt like an eternity, the rope was finally welcomed back to us with open arms. 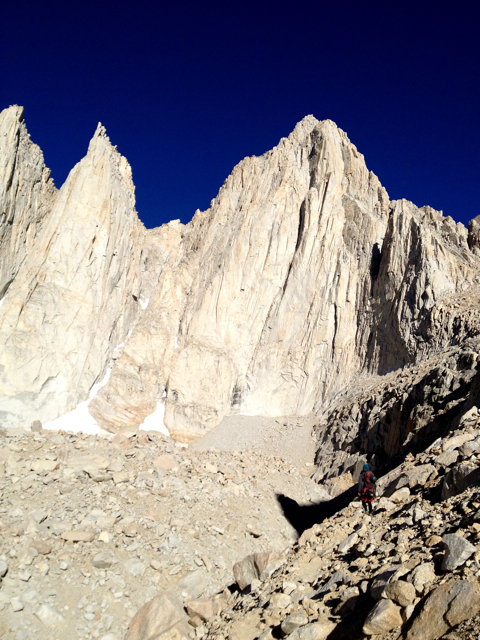 Because I'd done Mithral before and my leg was getting worse, LeeAnne led back up the beautiful dihedral. We'd read that triples were necessary for both routes, but we thought doubles were probably sufficient. For the link-up and rappelling, triples might be a good idea if you want more gear to protect the pitches (we only had triples in .5 and .75 and were fine though). A #4 was also appreciated. I had forgotten how much 4th class you have to do after the dihedral, and I don't think we were to the ridge until 6:00. 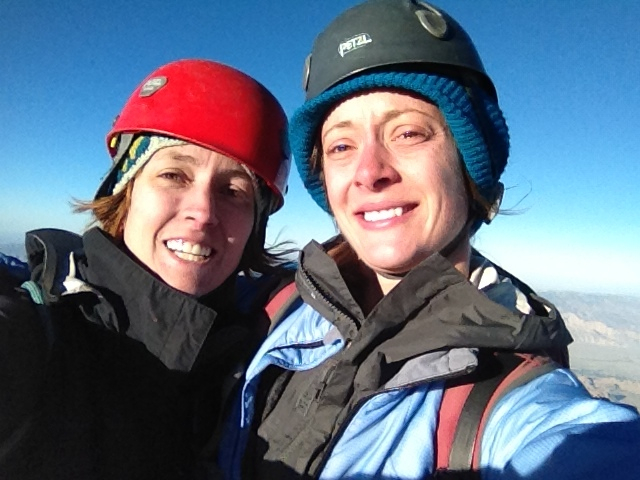 In total that put us at 7 hours of climbing, rappelling, and scrambling at the top for the link-up. We stayed on the northern side of the east ridge for the most part of the descent, and made a quick jaunt up to the east summit. One thing about the descent that's good to know, which we eventually figured out without any help from the descriptions of the east ridge descent, was that once you follow the east ridge all the way down to the Russell Carillon pass, continue to walk all the way down the sandy plateau. Don't be lured by the gullies or cairns on your right. At the end of the plateau there's a really chill sandy scree hill, and you can dig in your heels and skate basically all the way down to upper boy scout lake (awesome). The rest of the timing is a bit fuzzy, but after finding some manzanita again on the way down, we were back to the car by 11:30pm. So, as I seem to do on my C2C days, at 20.5 hours, we started and ended the day with headlamps (but really, I wouldn't have it any other way). Looking up at the exquisite Mithral Dihedral. LeeAnne and I both enjoyed Star Trekkin' more than Mithral, which was surprising given the popularity of Mithral and lack of attention Star Trekkin' gets. The moves through the cruxes of Star Trekkin were so cool, and that hand crack - amazing. Don't get me wrong, Mithral is awesome, but it does have some awkward sections (especially those pods in the corner). What a day! Big thanks to LeeAnne and to Ben for the inspiration. Until next time north fork, if I see another manzanita it will be too soon. Mt Russell, Star Trekkin’ and Mithral Dihedral "link-up"
p.s. although not captured in any photos because it was just too dang cold, I was wearing my zebra print spandex underneath my soft shell pants. The pullharder spirit and the force of the spandex were with me all day. Ben, every time I spoke with you or saw you (and even sometimes in random emails), you always asked me to write a trip report. -But I don't have anything I want to write about. -Then do something you want to write about. Well, I did, and it was inspired and motivated by you, but you sadly never got to read it. Your positivity, energy, and psyche, will always amaze me. Gil, I never did tell you all the times that you inspired me, what a pleasure it was to see you grow over the years, and just how much I respected you. I'll never forget the time I went to Woodson with you and Jack, thinking back on those days always makes me smile. 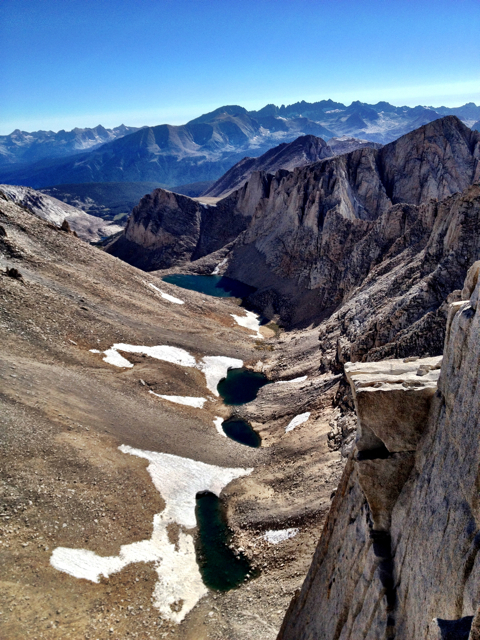 I sadly didn't get to the High Sierra with either of you, although we always talked about it. I can say that I was fortunate to share a rope with both of you over the years, and honored that your were my friends. FILES. In loving memory of Gil Weiss and Ben Horne - May we continue to honor the inspiration you have given us by trying to be inspiring ourselves.